The 7th New Frontiers in Cardiology Congress was held on 17-19 February and organized by the Association for Research and Development of the Faculty of Medicine (AIDFM), in coordination with the Cardiology Service of the Northern Lisbon Hospital Centre (CHLN) and with the Cardiology University Clinic of the FMUL. As usual, the event began in the Aula Magna of the FMUL and then was held over the next two days at the Praia D’El Rey Marriott Hotel in Óbidos. In this Congress, the topic of discussion focused on the huge evolution that the new frontiers promote, not only in terms of diagnosis and cardiovascular therapy but also particularly Heart Failure and Pulmonary Arterial Hypertension, Cardiovascular Imaging, Intervention Cardiology and Arrhythmology, Coronary Disease, Valvular Heart Disease, Cardiomyopathies, Cardiac Surgery, and Vascular Surgery. This event was chaired by Professor Fausto J. Pinto, Director of the Faculty of Medicine of the University of Lisbon, Full Professor and Director of the Cardiology University Clinic, Director of the Cardiology Department and of the newly created Department of Heart and Vessels of the CHLN. 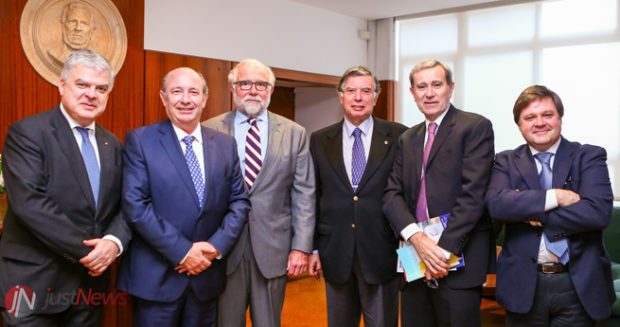 It was also attended by Professor José Fernandes e Fernandes, Full Professor and Director of the Institute of Clinical Semiotics of our Faculty. The Congress was also attended by several national and international specialists. There were speakers from several countries, such as Germany (Stephan Rosenkranz and Michael Böhm), Italy (Aldo Maggionni), the Netherlands (Freek Verheught and Jeroen Bax) Sweden (Lars Ryden), and the United States of America (Alan Gass and Bertrand Pitt). Watch the interview with Professor Fausto Pinto here. Image Credits – Congresso CAML – Cardiologia and Just News.